Future cities will likely be dominated by automated, connected, electrified, and shared (ACES) vehicles. According to The Center for Automotive Research (CAR) research, by 2035 there will be worldwide adoption of robotaxis and automated shuttles in mixed traffic with SAE level-5 automation. By 2040, there could be market saturation of automated vehicles, and new mobility services could constitute a major share of auto industry revenues. In the evolving mobility ecosystem, customers are increasingly asking for more personalization, connectivity, safety, and infotainment features. Customers are also cognizant of the vehicle’s exterior design, durability, recyclability for environmental sustainability, and overall performance. Additive Manufacturing (AM) or 3D Printing is a revolutionary group of technologies that can help automakers cater to the desires of their customers by providing unique solutions for vehicle design, manufacturing, and the overall automotive business. AM provides greater design freedom and part complexity because the parts are built by adding layers of materials, exactly opposite of machining where the material is removed. Moreover, AM part production costs do not increase significantly with part design complexity, and since the material is added just where it is needed, material scrap is minimized. The raw material could be plastic, metals, wax, sand, or composite. The concept of AM is not new; however, its use in traditional manufacturing industries started only two decades ago with rapid prototyping. Near future uses of AM in automotive include tooling and low-volume part production. 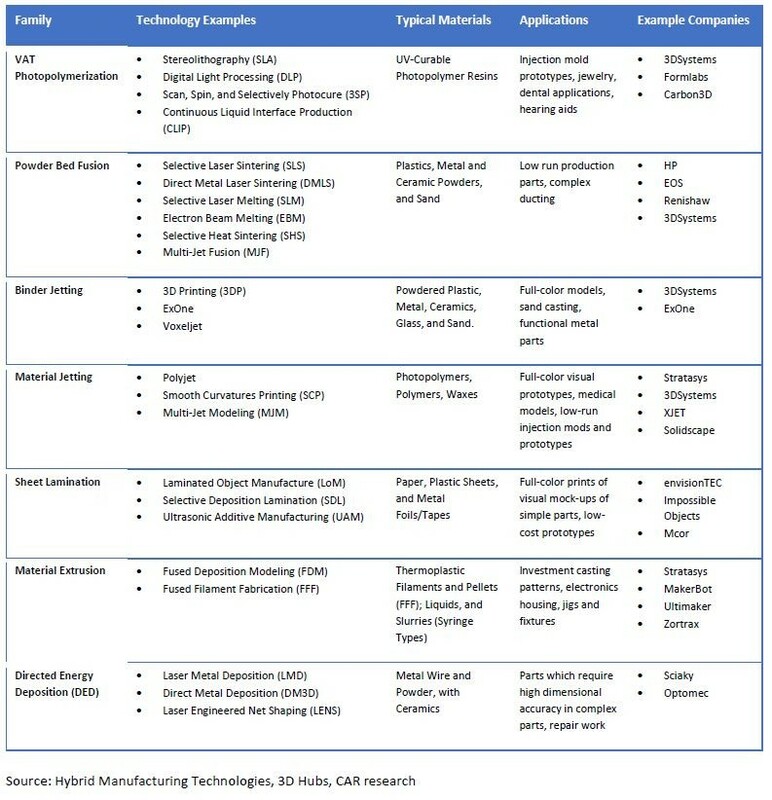 The phrase additive manufacturing is a broader term for the numerous technologies that fall under the same umbrella. The table below lists the seven families of AM technologies defined by the American Society for Testing and Materials (ASTM). Materials for AM are not widely available commercially. Not all CAE design software are ready to handle simulations for AM parts. Current material qualification processes and decision matrices are optimized for traditional manufacturing. Cycle times are currently not suitable for high volume part production. Post-processing is a time-consuming and expensive operation. Each AM technology and machine has its advantages and limitations. Not everybody in the industry understand the differences. High initial capital investment in machines which may become obsolete in few years. Automakers are extremely careful in selecting unproven technologies for production because the automotive business is high investment, high risk. Fear of intellectual property being stolen in digital transfer. Parts can be reproduced using only the design files since AM does not require expensive tooling. Finding talent with knowledge of AM. Nonetheless, the analyst community remains enthusiastic about AM’s future in the automotive industry. The forecast from various organizations predicts exponential growth between 2020-2030. 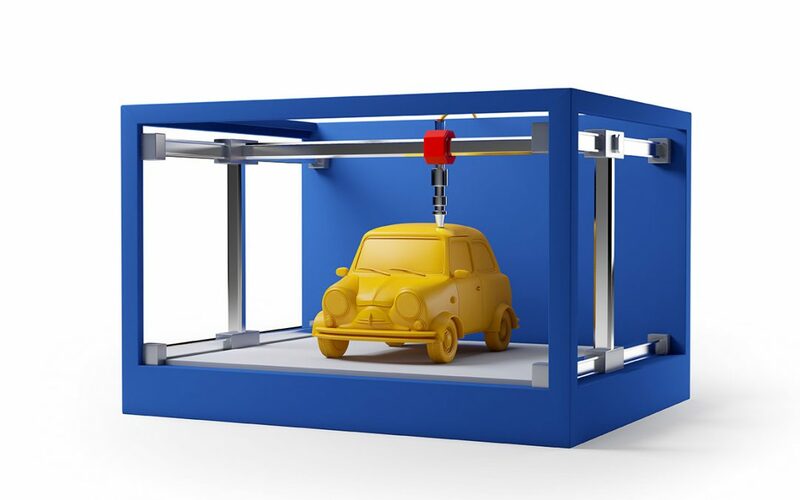 Research by various market consulting firms shows the AM global automotive market size was estimated to be more than 1.4 billion in US dollars in 2017 with the annual sales of more than 110 thousand 3D printers. We at CAR believe that a collaboration of government, industry, and academia collaboration and teamwork can solve AM’s challenges faster and cost effectively. 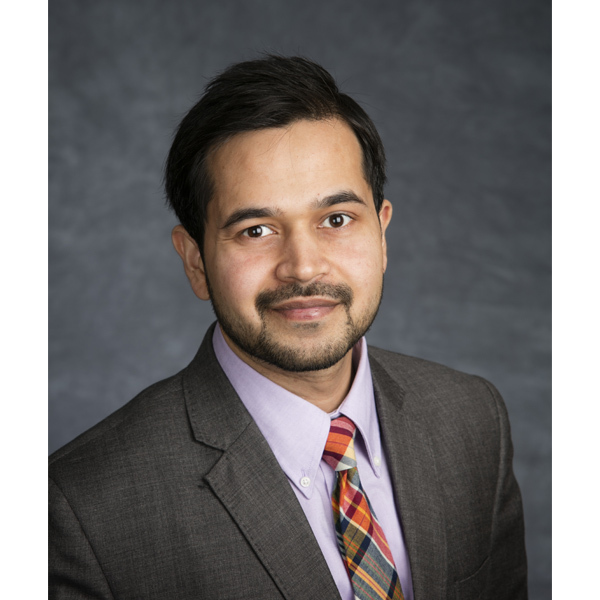 There is a strong need to engage the right experts representing a broad section of the industry, assemble teams, collaborate on pilot projects, deliver and publicize results across the industry, and create a Plan-Do-Check-Act (PDCA) loop. To obtain an industry perspective, CAR organized brainstorming sessions with representatives from multiple automakers and suppliers to discuss the advancement in AM, challenges to incorporating its adoption, and the path forward. A recent CAR whitepaper consolidates a summary of the discussions from the meetings and an extensive literature survey performed by the CAR team. This topic, and much more will be discussed at CAR MBS in the Future Factories session. Registration is now open, and we invite you to secure your seat for three days of compelling insights, thought-leading panel discussions, and networking that you won’t find anywhere else.